A lot of work goes on behind the scenes to deliver you the best candidates that are out there. It’s a common misconception that recruitment agencies “simply send out CV’s”. It goes without saying that the most talented candidates are in short supply, and we work tirelessly to make sure we know who they are and to reach them with your roles. To help with transparency so that you can understand just what we do day to day, we’ve outlined what a regular daily routine consists of. A typical day for us kicks off early in the office and after a natter and a brew we’re busy scouring the industry for the most talented candidates. As well as going out of our way to find awesome candidates ourselves, many candidates will also come directly to us looking for a job, so part of our day involves looking through their CVs and talking to them on the phone. When we find a candidate for a vacancy, we don’t just get them an interview and send them on their way. Instead, we’re there to provide guidance and support throughout the entire process, from providing interview advice, to sorting out all the nitty-gritty details on their behalf with the client. We like to go above and beyond our role to make sure that our candidates are completely satisfied and happy with their new role. If someone is moving country for a role for example, we’ll help them to organise flights and find housing close to their new company. Alongside our recruitment day-job, we run our graduate initiatives Grads In Games and Grads In Tech. This involves organising graduate talent competitions like Search For A Star, as well as our university careers tour Get In The Game. These big events tend to keep us very busy all year round! But it’s well worth it, as it’s through our graduate activities that we meet thousands of students and graduates who we end up placing into the games industry. Molly Shepherd-Boden is part of our resourcing team here at Aardvark Swift. How would you describe the work you do? I support the consultants, working with them to make sure they've got everything they need to do their job effectively. This means there's a good range of tasks, but the essential part of the role is communication. I’m often the first point of contact for new candidates, will make all the arrangements for interviews, and also spend time catching up with existing candidates to see how we can help them! Every day involves talking to a lot of people on the phone, speaking with candidates and clients. I’m a really chatty person so it’s fun speaking with all the candidates. We’ve all been in the position that they’re in, trying to find a new job is stressful. So it’s really rewarding when the end result comes through and everyone is happy with the situation. We can all relate to trying to find a new job, so it’s rewarding being able to give them a bit of peace of mind and hopefully get them into a role they love. What's your Aardvark Swift career journey so far? I’m still relatively new here so I’m going through my training now. We have a really good online programme with Enabling Change which has been really helpful. 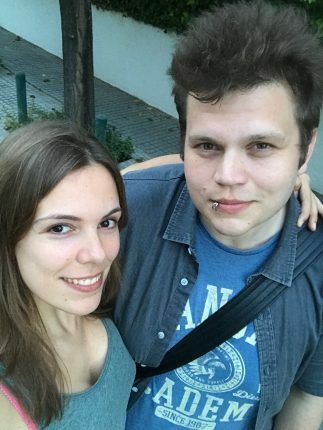 My journey has been been amazing so far and everyone’s been really friendly. Even since my first day I’ve been able to get really involved with the team and it's great to be learning more and more each day. It’s been the best way to learn! Coming straight from university to starting my career in recruitment has been educational, I’m learning something new every day. I love spending time chatting with candidates and finding out about people’s lives, it’s a real eye opener. What brought you to Aardvark? I have just graduated from university where I studied English Literature and Language. Recruitment had always been something that I was interested in, but I needed the right team. As you walk into the Aardvark office, you see colourful walls and everyone seems really happy, it seemed like a great team and atmosphere to work in. Dan Hawkins is one of the newest members of our recruitment team here at Aardvark Swift. My average day involves speaking with new candidates, talking to my clients about their roles, managing interviews, and making as many calls as possible! I always have lots of different conversations going on at the same time. I do a lot of the same kind of work as the other recruiters but am still being eased in a bit, so have lower targets and access to a lot of extra support from both management and the rest of the team. It's a really constructive and encouraging environment, and everyone's been great at helping me settle in. I like making placements and putting people into jobs that they really want, I get a kick out of it, it’s a really good feeling. I’m only at the start of my journey and I’m already getting to the point where I’m making good money and placing people in their dream jobs. It’s the best of both worlds. I’ve had lots of training already and I’ve only been here 9 months. It’s probably my favourite part of working at Aardvark, they provide training and offer support all the way through. After I finished my initial training I got given my own industry sector to specialise in, and have been really getting to know the people and clients involved. I love the industry. There’s nothing quite like Aardvark in the local area, being able to work in video games with many of the best video game creators and studios in the world. I was travelling before I started here, but before that I was a manager in a call centre. My sales background there is a perfect fit for recruitment & made it pretty easy to adapt to the new processes required. Learn more about joining Aardvark as a trainee or junior recruiter - we're currently hiring, so get in touch! Max Stuart is a Recruitment Consultant on the creative team at Aardvark Swift. As a consultant, Max specialises in 3D & 2D art, alongside UI and UX design. I manage all the job vacancies in my sector, go through emails and online applications that have come in, and spend the rest of my day consulting with my candidates and clients through either Skype, calls or Linkedin. I spend most of my time working with people to get them the best roles, getting to know new candidates, and negotiating job offers with studios. It can be tough - sometimes you’ll think you’ve done some really good work and nothing comes from it, but keep working on your roles and good things will happen. It’s very varied, which is fun and exciting, and I’ve built strong relationships with candidates and clients which is great!. I started with a 10 week training plan with Glenn our performance manager, and we’ve had further specialised training through an external company, which has all been very useful in both learning the job role & focusing my skills. It’s been successful so far and the future looks pretty promising, so I can’t wait to see what’s going to come next. I used to work as a marketing assistant but it wasn't for me - I felt like I'd be better suited for sales, so I left to find a new opportunity. When I was looking for a new job I went to a recruitment agency and told the consultant my skills and experience and she asked me whether I’d ever thought of doing recruitment. I’m quite sociable and like to have set goals to aim for, so this suits me much better! Learn more about joining Aardvark as a Recruitment Consultant - we're currently hiring, so get in touch! Sharan Bassi is one of our Senior Recruiters at Aardvark Swift. 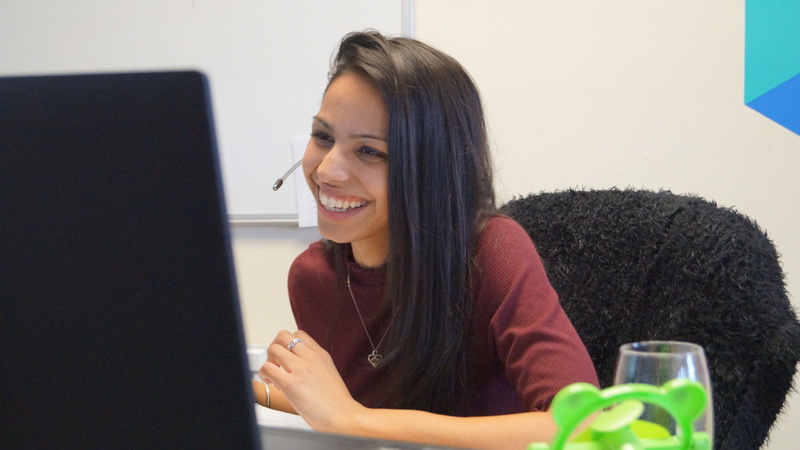 As a senior recruiter, Sharan leads by example, mentoring those on her team and supporting recruitment in other business areas across the company. Sharan also has additional responsibility with the management of the Search For A Star competition and all of our Get in the Game career talks. Day to day, I'm always speaking to studios about the work we're doing on their roles, or to graduates looking to get into the games industry. With graduates, a lot of my role is focused on advising students looking for their first job, helping them to create great CVs and portfolios that I can then bring to the studios we work with. I've been working in this area for a few years now, so have the knowledge & experience to confidently direct them down the right path. As a senior recruiter, I'm also more involved with creating and improving on our relationship with clients. For me this means I care for all of the really strong relationships we have with our sponsors, partners and patrons, getting to work closely with some lovely people. I started straight from uni where I studied English Literature, but I'd been working in sales jobs since leaving school so already had some relevant experience. I'm always on the lookout for ways to improve my personal development, which the management team at Aardvark recognised early on & has always supported me with. 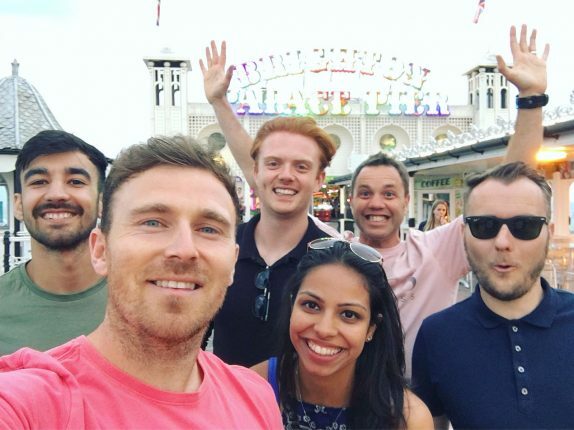 I've always challenged myself to develop my skills and knowledge, and being a part of the graduate team gave me so much opportunity to share that experience, leading to me taking on more responsibility as a senior recruiter. Learn more about joining Aardvark as a Senior Recruitment Consultant - we're currently hiring, so get in touch!